"Soon to be in family way." Mira Nair's Monsoon Wedding is one of the most enjoyable and easily accessible foreign films I have ever seen. It focuses on a small slice of Indian culture, but at its heart, it's the story of a family coming together, a celebration of a universal human desire to love and be loved�something that can be appreciated by anyone, regardless of race or nationality. The story follows the Verma family, Punjabi Indians who live in Delhi, as they prepare for the wedding of their only daughter Aditi (Das), arranged to be married to Hermant (Dabas), whom she's never met�he's been living in America for years. While Aditi and Hermant are stepping unsurely into their new lives, Aditi's parents, Lalit (Shah) and Pimmi (Dubey) are in an altogether different point in their lives. They've been married so long, the passion has faded, replaced by trust and familiarity. As the two watch their daughter slowly warm to the idea of marrying a man she's never spoken to, they again rediscover their own feelings. 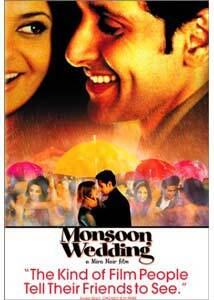 The kaleidoscopic storyline of Monsoon Wedding is rich in color and full of detail. Other characters include Dube (Raaz, in a scene stealing performance), the harried wedding planner (or, as he bills himself, "event coordinator") who designs traditional Punjabi weddings while talking on his cell phone and trading stocks on the Internet. Dube unexpectedly finds himself doting over the Verma's maid Alice (Shome), and their blossoming love, one that goes against the traditional class boundaries, provides some of the most joyous moments in the film (both characters have an unusual taste for marigolds�she eats the flower, and Dube pops the whole thing into his mouth; clearly they were meant to be). Elsewhere, serious subplots pop up as Aditi's cousin Ria (Shetty) deals with troubling memories from her past and must rely on her father to break tradition and do the right thing. And Aditi herself, even on the eve of her wedding, is unsure if she wants to marry Hermant, though he seems perfectly charming when they talk. She's lived at home her entire life, you see, and moving to America with a man she barely knows is the most frightening thing imaginable�worse, even, than choosing to end her relationship with her lover, a TV host. One of the most delightful things about Monsoon Wedding is the way that Nair reveals the Velma family in fits and starts. They are developed naturally and realistically; on-screen, they are never less than a living, breathing family. They fight (her parents have a heated argument about sending her younger brother to boarding school), but they are drawn together by unconditional love as well�Lalit stands over his girls, watching them sleep, and promises to devote his life to improving theirs. Many Westerners question the tradition of arranged marriages, thinking it impossible to find love and build a family with a stranger. Nair reveals that, perhaps, simply committing together is the first step. Wonderful details abound, including an intricate reproduction of a traditional wedding ceremony and the preparations leading up to it. The hustle and bustle of the celebration adds not only a bit of structure to the storyline (building suspense as well), but revels in the examination of a cultural tradition in intricate, colorful detail. Throughout, the characters speak a mix of English, Hindi, and Punjabi, sometimes all at once, and the mish-mash brings the film to life, the competing languages matching the eccentric mix of characters, from the older traditionalists to young moderns like Dube. Nair, best known for directing Salaam Bombay! and Kama Sutra, decided she wanted to make a Bollywood film on her own terms, independently and with total creative control. Shot in only 30-odd days, the resultant picture is more alive and full of energy than the most frenetic Michael Bay blockbuster. Declan Quinn's gorgeous cinematography captures the rainbow palette; his use of handheld camera only makes everything feel more alive, more intimate. This film, like last year's art-house hit Am�lie, shows the potential of foreign films to shake American movie-goers awake, to force them to open their eyes to other cultures and other traditions. That they manage to be so entertaining at the same time is just a bonus. Image Transfer Review: Ok, so you're miffed that Universal did not grant Monsoon Wedding anamorphic enhancement. I am too. There's no excuse these days for a new theatrical release to make its DVD debut sans a 16:9 encoded transfer, even if it is an independent foreign film. But once I got over the injustice, I realized that the transfer is still quite nice. The color palette is just gorgeous, with rich hues all across the spectrum, with no apparent bleeding. Blacks are solid, with good shadow detail throughout. Despite some graininess, fine detail is very good. I noticed no artifacting edge enhancement, and only a tough of aliasing on some complex patterns. Audio Transfer Review: So no anamorphic support, but DTS is included? Hmm. Both the DTS and DD 5.1 tracks sound great, though I have to admit I can't say I hear a marked difference in quality between the two. In both tracks, dialogue is anchored in the center channel and sounds natural (though it isn't always understandable, thanks to the accents... thank goodness for subtitles!). The music is spread across the front soundstage, and is presented with excellent dynamic range and strong directionality. LFE provides support, though the film hardly warrants rumbling bass. Surrounds are used infrequently, but do occasionally provide subtle support for the score and atmospheric effects. Extras Review: Mira Nair provides an excellent commentary track, speaking intelligently throughout about all aspects of the production. She's great at pointing out different actors and explaining how they became involved in the film, and she's got a lot of cute on-set anecdotes, but she doesn't skimp on the technical details of the shoot either. I also especially enjoyed hearing her comments on the social commentary in the screenplay; most of Indian culture is foreign to me (no pun intended), and I suspect most Americans are in the same boat. It's a richer film once you absorb the cultural peculiarities that would otherwise pass by unnoticed. An eight-minute featurette from the Independent Film Channel offers some brief behind-the-scenes footage, along with interviews from Nair. With such a brief running time, it's not incredibly in-depth, but the on-set peeks are nice enough, and it's more or less free of the usual PR fluff. Although not listed on the back of the box, the theatrical trailer is also included, in 1.85:1 widescreen. Not an extensive extras package by any means, but anything is welcome when it comes to foreign films. The quality of the commentary boosts the grade a bit as well. Monsoon Wedding is as full of life as any film I've ever seen. Brimming with humor, warmth, and genuine emotion, it's a celebration of family and culture that will stay with you long after the credits roll. Call it "My Big Fat Punjabi Wedding."